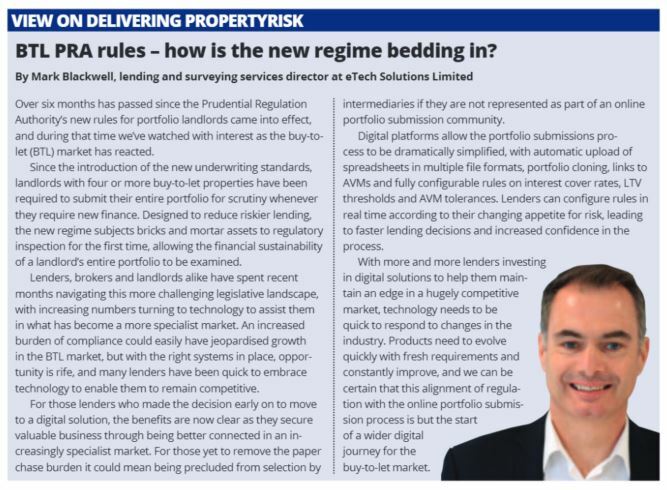 BTL PRA rules – how is the new regime bedding in? Over six months has passed since the Prudential Regulation Authority’s new rules for portfolio landlords came into effect, and during that time we’ve watched with interest as the buy-to-let market has reacted. Since the introduction of the new underwriting standards, landlords with four or more buy-to-let properties have been required to submit their entire portfolio for scrutiny whenever they require new finance. Designed to reduce riskier lending, the new regime subjects bricks and mortar assets to regulatory inspection for the first time, allowing the financial sustainability of a landlord’s entire portfolio to be examined. Lenders, brokers and landlords alike have spent recent months navigating this more challenging legislative landscape, with increasing numbers turning to technology to assist them in what has become a more specialist market. An increased burden of compliance could easily have jeopardised growth in the BTL market, but with the right systems in place, opportunity is rife, and many lenders have been quick to embrace technology to enable them to remain competitive. For those lenders who made the decision early on to move to a digital solution, the benefits are now clear as they secure valuable business through being better connected in an increasingly specialist market. For those yet to remove the paperchase burden it could mean being precluded from selection by intermediaries if they are not represented as part of an online portfolio submission community. Digital platforms allow the portfolio submissions process to be dramatically simplified, with automatic upload of spreadsheets in multiple file formats, portfolio cloning, links to AVMs and fully configurable rules on interest cover rates, LTV thresholds and AVM tolerances. Lenders can configure rules in real time according to their changing appetite for risk, leading to faster lending decisions and increased confidence in the process. With more and more lenders investing in digital solutions to help them maintain an edge in a hugely competitive market, technology needs to be quick to respond to changes in the industry. Products need to evolve quickly with fresh requirements and constantly improve, and we can be certain that this alignment of regulation with the online portfolio submission process is but the start of a wider digital journey for the buy-to-let market. Find out more about eTech’s Buy To Let Hub.